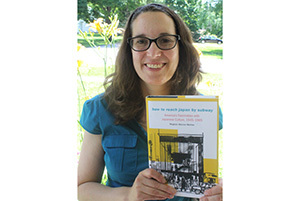 Upper Iowa University Assistant Professor of History Meghan Mettler has authored her debut book, “How to Reach Japan by Subway: America’s Fascination with Japanese Culture 1945-1965.” The book began as the author’s graduate dissertation, before it was recently published by University of Nebraska Press eight years later. Japan’s official surrender to the United States in 1945 brought to an end one of the most bitter and brutal military conflicts of the twentieth century. U.S. government officials then faced the task of transforming Japan from enemy to ally, not only in top-level diplomatic relations but also in the minds of the American public. Only 10 years after World War II, this transformation became a success as middle-class American consumers across the country were embracing Japanese architecture, films, hobbies, philosophy, and religion. Cultural institutions on both sides of the Pacific along with American tastemakers promoted a new image of Japan in keeping with State Department goals. Focusing on traditions instead of modern realities, Americans came to view Japan as a nation that was sophisticated and beautiful yet locked harmlessly in a timeless “Oriental” past. What ultimately led many Americans to embrace Japanese culture was a desire to appear affluent and properly “tasteful” in the status-conscious suburbs of the 1950s. In “How to Reach Japan by Subway,” Mettler studies the shibui phenomenon, in which middle-class American consumers embraced Japanese culture while still exoticizing this new aesthetic. By examining shibui through the popularity of samurai movies, ikebana flower arrangement, bonsai cultivation, home and garden design, and Zen Buddhism, the UIU history professor provides a new context and perspective for understanding how Americans encountered a foreign nation in their everyday lives. Mettler plans to author a follow-up study from the opposite perspective and examining the United States’ efforts to burnish its overseas image by exporting American culture. For additional information about “How to Reach Japan by Subway: America’s Fascination with Japanese Culture 1945-1965,” visit the University of Nebraska Press or Amazon websites.